A lenticular cloud often drapes over it like a wet, vapory blanket. These stationary clouds typically form over mountain peaks or other protruding landmasses. 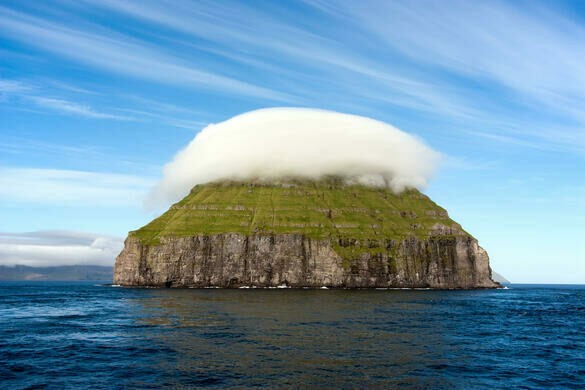 Lítla Dímun’s lenticular hovers above its top, occasionally spilling down over the verdant land as it reaches toward the cold sea. 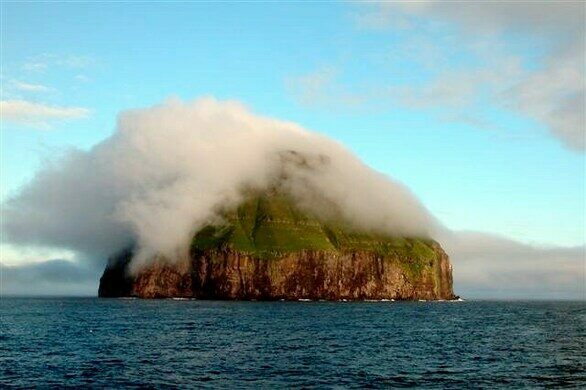 Of the Faroe Islands’ main islands, the little landmass is the only one that remains uninhabited by humans. But people do visit the island. For centuries, Faroese farmers have made the precarious journey to Lítla Dímun to tend to the creatures who rule the islet: its sheep. Up until the middle of the 19th century, Lítla Dímun sheep ruled the little green haven. It’s believed these black, short-tailed feral sheep were the descendants of the animals brought to the area during the Neolithic era. 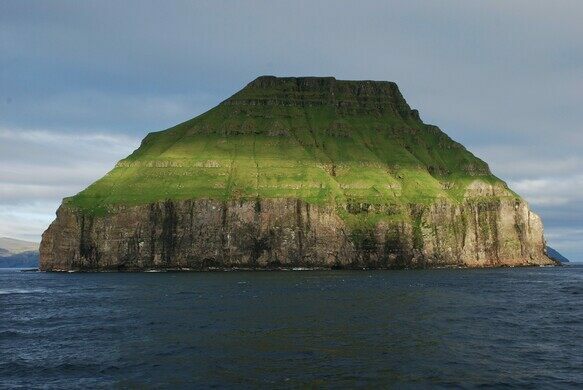 But after the last of these rare creatures was shot in the 1800s, rendering the bloodline extinct, the island became home to domesticated Faroes sheep. Every fall, farmers head to Lítla Dímun, scale its slick cliffs, and round up the sheep to bring them back to the main islands. You'll most likely have to stick to admiring this island from the villages of Hvalba and Sandvík on the island of Suðuroy. It is possible to visit Lítla Dímun, though it's rare to have weather that's good enough to make a visit feasible, as you must use the ropes left by the farmers to help climb the cliffs.